THE Government has announced a week of mourning following Sunday bomb blasts that claimed the lives of 74 people, among them 14 foreigners. 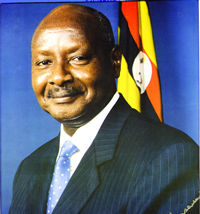 The seven days declared by President Yoweri Museveni begin today, according to Beatrice Wabudeya, the Minister for the Presidency. All flags at public buildings countrywide will accordingly fly at half-mast, said the statement that described the attacks as “cowardly”. People were asked to observe the days in respect of those who lost their lives while watching the World Cup finals at the Kyadondo Rugby Club in Kampala. The other deadly explosion occurred at an Ethiopian-owned restaurant in Kabalagala, a city suburb. Addressing a news conference at the Media Centre in Kampala yesterday, Inspector General of Police Maj. Gen. Kale Kayihura dispelled reports that another bomb went off yesterday in Rubaga, another suburb. Kayihura also announced that a joint team had been formed to investigate the tragedy that sent shock waves through the entire country. The Police have released hotlines, which people can call to offer information to security personnel. They are: 0800199088 (CPS incident room), 0800199188 (Mulago Hospital Casualty Unit) and 0800199288 (Media Centre). Kayihura issued guidelines intended to deter terrorist attacks. They include controlling access to buildings and other public places. The public, he stressed, should be on the lookout for suspicious, abandoned items like bags, cars, electronics, mobile phones, watches or any other items with loose or strange wires attached. They should also be on the lookout for suspicious-looking people in their neighbourhood and report them to the authorities. The Police said all organisers of public events, including parties and prayers, should involve the Force in planning and preparation of such events. The Police, Kayihura announced, would inspect premises to see if they have adequate security arrangements. Places to be inspected include schools, places of worship and commercial premises. Meanwhile, the Somali Islamist group, al-Shabaab, said last evening it was behind twin blasts which hit Kampala. “We thank the mujahideens that carried out the attack. We are sending a message to Uganda and Burundi, if they do not take out their Amisom (African Union Mission in Somalia) troops from Somalia, blasts will continue and it will happen in Bujumbura,” said Ali Mohamud Rage, according to BBC. Internal affairs state minister Matia Kasaija told the BBC that the severed head of a person from Somalia had been identified at the scene of one blast. In a related development, an American terror expert contended that the deadly twin bombings could have been “Plan B” for terrorists looking to make a strike on the World Cup, but unable to penetrate South Africa’s security. Ronald Sandee, the director of analysis and research with The NEFA Foundation, said Uganda, while of strategic significance to al-Shabaab, may not have been the primary target. Sandee said intelligence sources told him that while al-Shabab has taken responsibility, an al-Qaeda operative, Harun Fazul, is suspected. Meanwhile, grief-stricken people yesterday spent the entire day at the Kampala City Council mortuary trying to identify friends and relatives who perished in the bomb blasts. They started flocking to the mortuary as early as 7:00am. But they were only allowed to access the city mortuary at around 6:00pm to establish whether their relatives were among the dead. The Police had barred people from accessing the Mulago Hospital Mortuary. However, officials told relatives to return today and pick the bodies. One of the survivors, Henry Kalemera, who spoke to The New Vision at the mortuary, also spent the entire day waiting to identify the body of a relative, Joyce Kiiza. Kalemera narrated that he was with Kiiza at the Kyadondo Rugby Club when the bomb blasts occurred, but later lost contact with her. “I was enjoying the match and everything happened so fast when the bombs went off. I then searched for her in vain,” Kalemera said. Other people were too grieved to talk at length about the tragedy.